The world's first regular government airmail service was inaugurated in the United States on May 15, 1918. Planes were scheduled to take off simultaneously from New York and Washington, D.C., each stopping at Philadelphia on the three-city relay route. The plane out of the nation's capital was piloted by Lieutenant George Boyle, who had limited flying experience, but whose future father-in-law was the well-connected head of the Interstate Commerce Commission. With a crowd of onlookers and dignitaries, including President Woodrow Wilson and the First Lady, the northbound flight took off from Potomac Park field, behind schedule and headed south. The young pilot, wondering why things on the ground did not look quite right, crashed the plane in a farmer's field in Maryland, and the mail was carried back to Washington on wheels for the next day's flight. 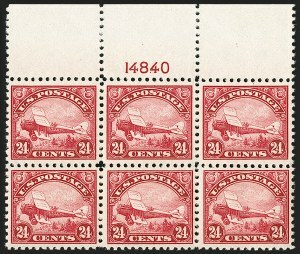 The Grounded Plane stamps, in which the wheels of the plane break through the top of "Cents", come from portions of three sheets. The discovery sheet was owned and broken up by John Klemann of Nassau Stamp Company. 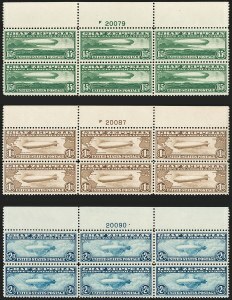 A second sheet was discovered in 1946 and sold in the Thomas A. Matthews sale (H. R. Harmer 11/4/1964), where it was purchased by Georges A. Medawar, publisher of Sanabria Airmail Catalogue. In Linn's 4/21/1986, specialist Joseph R. Kirker, Jr. published his research revealing the existence of a third source of this variety. 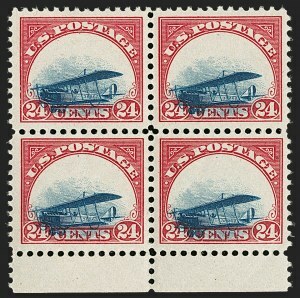 All known sheets are from the first printing, which produced the world famous Inverted Jenny error. The first printing has selvage at bottom and left, and was trimmed to remove the top and right selvage; therefore, a plate block cannot exist. 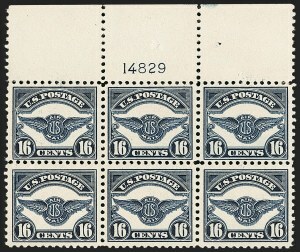 Top position plate blocks are extremely difficult to obtain in Mint N.H. condition with superior centering. We have offered only nine Mint N.H. top position plate blocks since keeping computerized records, and none compare favorably to the example offered here. The Fogelson collection, known for its quality top plate blocks, had one in lightly hinged condition.